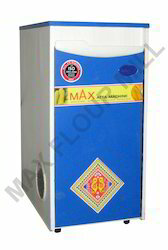 Offering you a complete choice of products which include max star flour mill. • 6 - 8 kg. / hour grinding capacity (normal jelly). •Consumes 1 unit / hour Electricity. • Aluminium cast one piece chamber. • M.S. Four blade zinc coated and balanced bitter. • 305 width x 457 length x 762 height M.M. Approx. • 50. Kg. Weight approx. • 1 & 2 aluminium jelly, 3 - 6 m.S. Jelly. Looking for Max Mini Flour Mill ?